A large swamp separated the advancing Union army and the Confederate defenders one-half mile north. 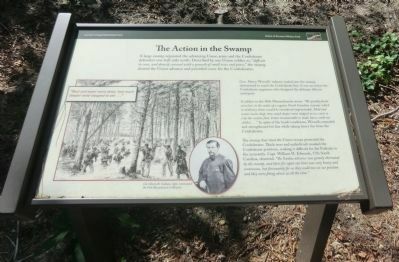 Described by one Union soldier as, “difficult to cross, and densely covered with a growth of small trees and pine,” the swamp slowed the Union advance and provided cover for the Confederates. Gen. Henry Wessell’s infantry waded into the swamp, determined to reach the Confederate line. It was an action the Confederate engineers who designed the defenses did not anticipate. A solder in the 45th Massachusetts wrote: “We quickly found ourselves in the midst of a regular North Carolina swamp, which in ordinary times would be considered impenetrable. Mud and water waist deep, how much deep none stopped to see, roots to trip the careless foot, briars innumerable to make havoc with our clothes…” In spite of the harsh conditions, Wessells extended and strengthened his line while taking heavy fire from the Confederates. (center) Col. Charles R. Codman, right, commanded the 45th Massachusetts at Kinston. Erected by Battle of Kinston Military Park. Location. 35° 14.467′ N, 77° 35.267′ W. Marker is in Kinston, North Carolina, in Lenoir County. Marker can be reached from the intersection of Richlands Road (U.S. 258) and Measley Road, on the right when traveling north. Touch for map. 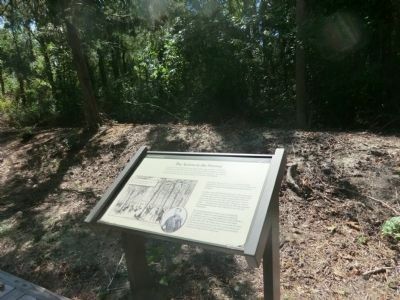 The marker is located on the grounds of the Kinston Battlefield Park. Marker is in this post office area: Kinston NC 28504, United States of America. Touch for directions. Other nearby markers. At least 8 other markers are within walking distance of this marker. Wessells' Advance—December 14, 1862 (here, next to this marker); The Center of the Confederate Line (here, next to this marker); The Union Artillery (within shouting distance of this marker); The Confederate Defenses of Kinston (within shouting distance of this marker); Caring for the Wounded (within shouting distance of this marker); Starr's Battery (within shouting distance of this marker); The Site of Harriet's Chapel (about 300 feet away, measured in a direct line); The Night of December 13, 1862 (about 300 feet away). Touch for a list and map of all markers in Kinston. More. Search the internet for The Action in the Swamp. Credits. This page was last revised on June 16, 2016. This page originally submitted on November 26, 2013, by Don Morfe of Baltimore, Maryland. This page has been viewed 440 times since then and 7 times this year. Photos: 1, 2. submitted on November 26, 2013, by Don Morfe of Baltimore, Maryland. • Bernard Fisher was the editor who published this page.